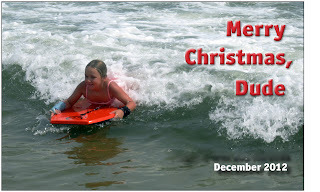 A couple of days after we got home from that week on the beach, meaning, back at the end of August, I got an email from my husband, with the subject "Getting a jump on Christmas". In it, he attached a photo from the trip, marked up as a Christmas card. Since our tendency is to wait until after Thanksgiving before even thinking about Christmas cards, I was a little, shall we say, startled. I'm not sure that this is going to be the card. I mean, Dude? Yeah, we know the Dude abides, but does he need a Christmas card? I do love that Christmas cards have been so embraced by the digital on-demand printing thing. Years ago, I always bought Unicef cards. Occasionally, we've made cards with rubber stamps and glitter. But since the girl arrived nearly nine years ago, it's seemed de rigeur to do a photo card. In a happy moment of synchronicity, about 30 seconds after I got the email from the Dude my husband, I got an email from a card company - Minted - asking if I'd like to review their cards. I've not used Minted before, but I've seen and received their cards - like from other people last Christmas - and they're really nice. The design selection ranges from sweet to clever to fun to playful, you can put more than one photo on a card, and you can put a paragraph of "what we did this year" on the back if you want. So one day soonish, before Thanksgiving but maybe after Halloween, we'll sit down and figure out a picture and a caption and we'll have Christmas cards, dude! Or is that Dude? Hey - if you want to try Minted - I'm giving away a $50 gift certificate. Comment below, and I'll draw a name out of a hat. As ever, make sure your email address is in your comment or that you're properly signed in - you can't win if I can't get in touch with you. Comments close on Tuesday 9/25. Disclosure: Minted gave me a gift certificate, which I'll use one day. The opinions are 100% mine. Dude! I have always thought about doing photo cards, but never do it (but would totally do it if I won the drawing, dude!). I do write the cheesy "this is what we did this year" letter, though, and put pictures in that and print it at home. Sure, I'm in. How on earth will I get my children together to take a photograph of them? Hmm. Heck yes throw my name in please! Why the hell not? OK tossing my hat into the ring. Duuuuuuude. I've sent photo cards in the past but not for many years. I always love them, sending or receiving. Your girlie's photo from last year's card is still up on our fridge. A gift that keeps on giving. I'm in, Dude. The Dude abides. The Dude also minds, man. I've spent most of my summer trying to get a photograph of my three children together for a Christmas card. It's a losing prospect. Oh I am HUGE with the Christmas cards. Feeling very late about not having chosen any pics yet but figured I had to go to Italy first. Last year I not only sent holiday cards but printed greeting cards and gave them as gifts (that no one will ever use because holy hell I'm the only person with a stash of greeting cards left in America who am I kidding?). I'm in! I don't know if I'll manage a picture of my eldest with out his hand in front of his face but I can try! Oooh, yeah! I'd love that. I'm probably somehow exempt, although I shouldn't be. So I would like to request shot at the gift certificate, dude. I need to get cracking on my holiday cards! I love their cards. I'm a huge fan of the photo card and I loved that pic when I first saw it. Oh, Minted is so cute. I love their stuff. Lucky you. Me, too! Christmas is the only time of year that I manage to purchase, address AND stamp cards before the holiday actually passes. Count me in! I do photo cards every year and I'm always open to a new company. The stampede for a gift certificate makes me laugh. 'Cause who doesn't want free stuff? I like how the digitizing of the world has made easier the whole card thing; I used to buy old books at Goodwill and then cut out photos and create a collage into which I'd paste photos of my family and, hey, WAIT, that actually sounds way more awesome than doing it digitally. Dang.